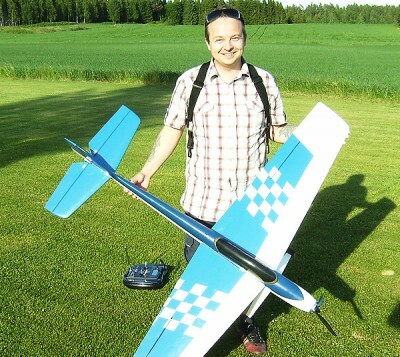 I finally got to fly the Mini Scalar that I spent the winter assembling and painting. The plane flew surprisingly well, requiring just two clicks of aileron trim. Surprising is putting it mildly, since I had to set up all incidences myself, my first time ever doing so. Nothing beats beginners luck. The plane is overpowered to say the least. I have never had a plane this powerful, ever. the 6s 4000mah battery was a good match and has enough power for two schedules pr. flight. I’m happy to have a new favourite practice plane for those quick out-to-the-field-before-wife-notices practice sessions. But I need more batteries, can’t stand waiting for them to charge at the field. And no, the props is not broken – it’s an Aeronaut folding 14×10 propeller, something that proved to be less than clever when used in combination with a motor brake on the ESC. A fixed prop is now on order, this plane really needs to slow down on the downlines and you can imagine how fast it is when the motor brakes – the prop folds and you have less, not more drag! This entry was written by Jon Gunnar Wold, posted on June 24, 2009 at 13:46, filed under electric, My planes and tagged electric, Mini Scalar. Bookmark the permalink. Follow any comments here with the RSS feed for this post. Post a comment or leave a trackback: Trackback URL.